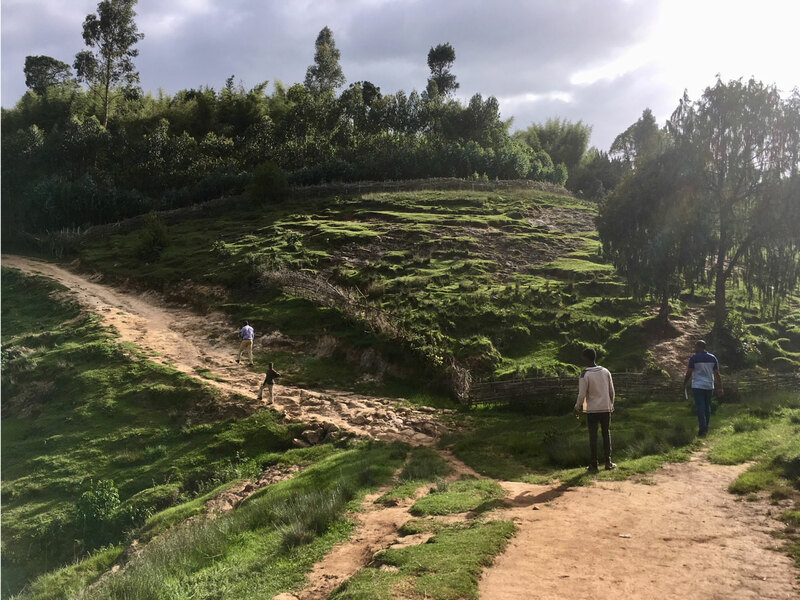 Over bumpy dirt paths, between rolling hills and past dozens of grazing cows, you can find the Ethiopian communities of Shote and Gisho, neighbors in an area where neighbors are rare. World Water Day 2019 is about bringing clean water, sanitation, and hygiene to the least, last, and the hard-to-reach places. That means places like Shote and Gisho in rural Ethiopia. With little to no available roads, getting trucks to the villages with construction supplies to build their safe water source posed a challenge that bordered on impossibility. But when families living in Shote and Gisho heard Lifewater was having trouble, they decided they’d build a road—with their own bare hands. Using pickaxes and shovels, men, women, and children chipped away at the rocks and into the hillsides. For two long months, they dug and lifted and dreamt of their new water source. Together, they dug nearly two miles of road. When the truck came, they carried rocks, concrete, and sand to the places—like the steep uphill spring—where no road could be built. Road built by Shote and Gisho, rural Ethiopia. With a new access road and supplies in place, Lifewater’s engineers were able to customize a system to protect the spring at its source and pipe safe water back to the villages. On World Water Day 2019, we pause to stand with a thirsty world and together say that solving the global water and sanitation crisis is within reach. In 1993, the United Nations (UN) established March 22 of each year to be “World Water Day,” an international day to bring awareness to the global water crisis. World Water Day 2019 is a time to both acknowledge the global water crisis and to take up action to solve it. Perhaps the most urgent reason to make a difference on World Water Day 2019 is the overwhelming number of preventable childhood deaths caused by unsafe water and poor sanitation. 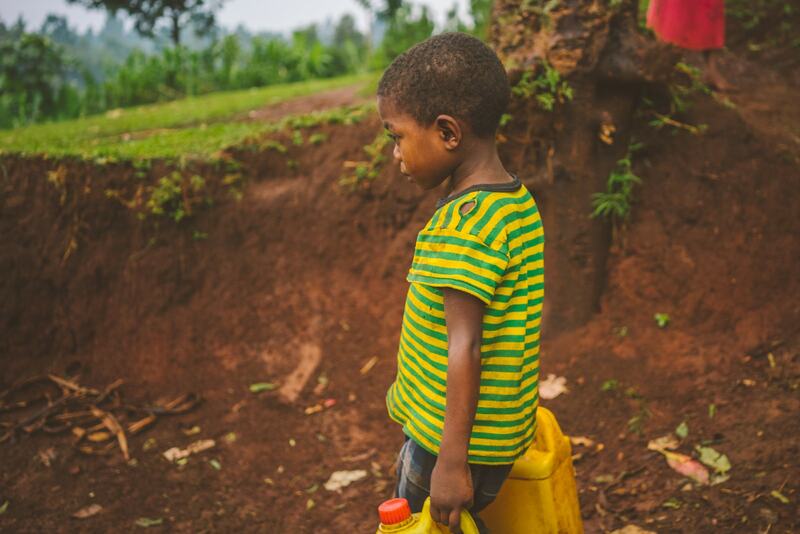 An Ethiopian boy carries containers of water to his home. Children who drink unsafe water become ill from diarrheal disease, and poor sanitation encourages the spread of disease from one child to another. Repeated bouts of this disease contribute to malnutrition, dehydration, weakening of the immune system, and makes other diseases more likely. The result is that rural villages are fighting for the lives of their youngest children. And when they have the opportunity to receive safe, clean water, communities like Shote and Gisho are willing to tow cement, sand, and stone every day until the Ethiopian sun burns red and yellow behind the hills. Solving the global water and sanitation crisis is within reach in our lifetime. But it’s going to take all of us—people who give, staff who serve lovingly, and communities willing to work hard to bring lasting change to their families. Global efforts to end the crisis are seeing progress. In 2000, the World Health Organization (WHO) and UNICEF found that nearly 1 billion people were drinking polluted water from hand-dug wells, ponds, swamps, rivers, and springs. Fifteen years later, that number has been cut in half. 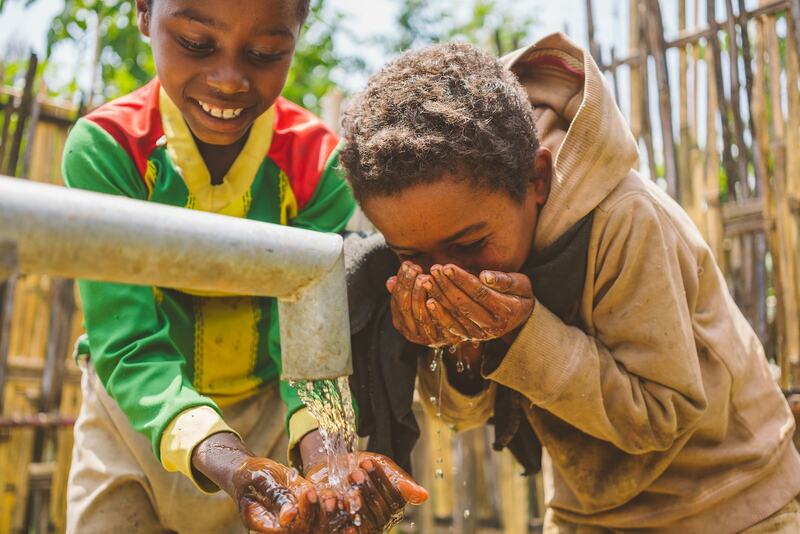 Children drink safe water from their new well in Ethiopia. Progress continues as governments, NGOs, and communities themselves make it their mission to see health and a path out of poverty for every family on the globe. Still, so many children suffer each year from preventable water-related illnesses, and we can do something about it. Here are three ways you can make a difference on World Water Day 2019. There are many organizations dedicated to ending the water crisis. At Lifewater, our programs focus on quality solutions that will last for generations to come. Staff visit every home to ensure that families learn life-saving health and sanitation practices and our engineers develop custom, long-lasting, safe water sources for every community, because one size does not fill all when it comes to water technology. Each project has a 5-year monitoring period in which water sources are regularly tested for water quality and functionality, and village-elected water committees gather user fees to pay for future repairs. Every person has a level of influence, and with social media, mobilizing others to make a difference is easier than ever before. On World Water Day 2019 (and any day, for that matter), talk about the water crisis, share stories of those in need, and encourage others to become involved in fundraising efforts that bring safe water to those most vulnerable. Follow us on Instagram at @lifewaterinternational, Twitter at @lifewater, and Facebook at Lifewater International for easy access to water crisis statistics, stories, and opportunities to give. Each day, the Lifewater team joins for 15 minutes to pray for an end to the water crisis. We invite others to join us in prayer, and almost daily, those prayers are answered. You can join our prayer team and receive monthly, insider-emails about the status of our global programs and the most urgent requests from our teams in the field. Click here to join us. Villages like Shote and Gisho are fighting for safe water, praying fervently along with us, and many more are waiting for their opportunity to give a brighter future to their children. Together, we can end the global water and sanitation crisis in our lifetimes.